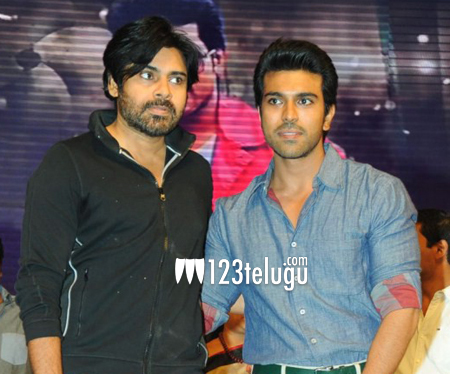 Pawan Kalyan’s voice over for Bruce Lee ? New info is being revealed regarding Ram Charan’s Bruce Lee as the days pass on. The latest updates reveal that Powerstar Pawan Kalyan is going to give his voice over for a brief part in Bruce Lee. It is well known that the unit has released a teaser on Pawan Kalyan’s birthday and there won’t be any surprise if Pawan Kalyan lends his voice for the film However, there is no official confirmation regarding this buzz. In the meantime, the team is fast completing the film’s shoot. Ace filmmaker Srinu Vaitla is directing it and Rakul Preet Singh is playing the female lead. DVV Danayya is producing the film which is slated to hit the screens on the 16th of October. SS Thaman is scoring the music.